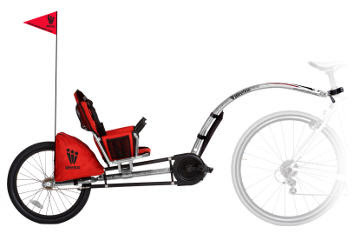 The Weehoo i-Go is a new tag-along / trail-a-bike concept for parents who really want to ride. The openness engages children for hours and encourages interaction between parent and child. Children can pedal as much as they want or sit and relax. While pedaling, children can exert so much force that you'll ride easier with your child than without. Effortless handling. Includes tons of storage, enclosed drive train, and ergonomic seat that quickly adjusts for different size riders. Coming soon to Century Cycles! Please add one to your rental department! Chris, you read our minds! We ARE adding a Wee Hoo to our rental fleet! This thing is amazing! The mechanics at Peninsula all give it the thumbs up. We rented one of these on Mackinaw Island, MI and it was great! Our kid wants one as his souveneir!